Of all the mansions remaining in Manhattan, this is perhaps the most enchanting, a deliriously detailed chateau with a myriad of deeply inset windows, arched windows, balconies, statues, and great tall chimneys. Designed by Kimball & Thompson, it was commissioned in 1895 in 16th Century French chateau style for Gertrude Rhinelander Waldo as one of the largest private residences in the city, but she never moved into it and Andrew S. Dolkart has written, in his book, "Touring The Upper East Side, Walks in Five Historic Districts" (The New York Landmarks Conservancy, 1995), "evidence suggests that she ran out of money before being able to complete the building." "Mimicking its French prototypes," Dolkart continued, "the Waldo house combines late Gothic and early Renaissance motifs, including statues of a monk, a knight, and other medieval personnages ensconced in second-story niches, and a roofline that bristles with projecting dormers, finials, and chimneys. The house remained unoccupied until 1920 when it received its first commercial tenant. It was transformed into the flagship Polo/Ralph Lauren shop in the mid-1980s." "The fortress heritage of the rural, royal residences of the Loire was not lost in the transfer to New York. The roofline is very fine....The Gothic is found in the high-pitched roof of slate, the high, ornate dormers and the tall chimneys. The enrichment is early Renaissance, especially at the center dormers on both facades of the building, which boast colonnettes, broken entablatures, finials on high bases, finials in relief and volutes. In fact, although the dormers are ebullient, ornamentation is everywhere, even in the diamond-shaped pattern in relief on the chimneys (traceable to Chambord)." "Gertrude Rhinderlander Waldo was a direct descendant of Philip Jacob Rhinelander, who settled in New Rochelle in 1696 and was the progenitor of one of the land-owningest families in Manhattan (an Upper East Side telephone exchange was RHinelander)....During its construction, the Waldos toured Europe again, where Mrs. Waldo purchased accessories for the house, but Mrs. Waldo never moved into her house, and most of the treasures she had collected in Europe remained in their cartons. By the time the house was finished, Francis Waldo [her husband] was dead, and Mrs. Waldo chose to live with her sister, Mriss Laura L. Rhindlander, whose house at 31 East 72nd Street overlooked Mrs. Waldo's dream turned sour. In 1908, a 'For Sale' sign hung in front of the building, but there was no sale, as much because of Mrs. Waldo's price tag as her impetuosity. One broker had practically consummated a sale, but while the papers were being drawn up Mrs. Waldo calmly said, 'I don't think I'll sell,' and walked out. By 1909, the Waldo mansion was dilapidated, its stonework discolored, its interior fittings damaged by the rain that leaked through the roof. Despite the ostensible protection of a high iron fence around the house, the $200,000 worth of bronzes, paintings, and tapestries that were stored in it became an easy mark, and four times within as many months the houses was burglarized. Two years later, Mrs. Waldo died, with $9,221 owed in upaid taxes and a $150,000 mortage on the house. The Dime Savings Bank came into ownership by default and tried to sell the plot with the assurance that an apartment house could be erected on the site. A restrictive clause covered the block, but the bank claimed that an apartment house was tantamount to a series of private houses within a multifamily dwelling and was well within the definition of a private house. The restrictive clause held, and the house stood vacant until 1921, when the first floor was converted for stores and two apartments were created in the still luxurious quarters above. It was the first time that anyone had ever lived in the place." Before Lauren took it over, the building was subdivided into a variety of spaces and at one time had some apartments on the upper floors and its lower floors were used at various times by Olivetti, the Italian company, Christie's, the auction house, and Zabar's, the gourmet food store, among others. Rhinelander Waldo was a hero of the Spanish-American War and also Police Commissioner of the City of New York and was a character in the novel, "Ragtime." 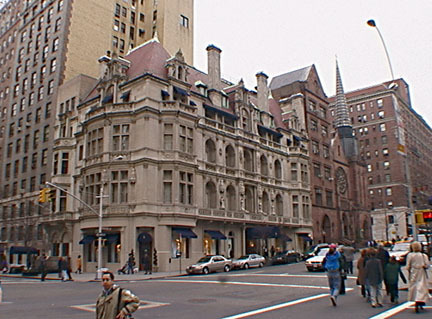 Lauren's conversion of the entire building into a flagship store was very handsomely done and several years later he took over the two-story building across Madison Avenue and converted it into a stunning flagship store for Polo, one of his fashion lines, and that building was highlighted by a double-story space with a working fireplace. The building is on land that slopes down towards the north and it has a midblock entrance and one at the corner. My mother briefly had an apartment in this building. In his October 7, 2010 "Streetscapes" column in The New York Times, Christopher Gray wrote that "Gertrude Rhinelander was born about 1837 into a family that had lived in New York since the 17th century, and in 1876 she married Francis Waldo, a stockbroker who had been ruined in the Panic of 1873. Her lifestyle, however, was never less than genteel; at her death in 1914, The New York Sun said she had inherited $2 million. Mr. Waldo died in 1878, and in 1882 Mrs. Waldo bought the southeast corner of 72nd Street and Madison Avenue, which despite its horsecar line was dotted with the mansions of those who eschewed the show of Fifth. The Real Estate Record and Guide reported that Mrs. Waldo was going to erect a mansion quite unique in design. She did not go ahead, but five years later bought the inside lot on the side street. Mrs. Waldo still did not build, and lived with her sister, Laura, in a row house across 72nd from the site. According to The Oswego Daily Palladium in 1889, Mrs. Waldo was a very pretty woman, and by some accounts she was keeping company with Charles Schieffelin, a lawyer. But in 1889 she sued him for stealing $12,000 she had given him to invest. Mr. Schieffelin, a Union Club member separated from his wife, counterclaimed that he and Mrs. Waldo were to be married, and that he had invested the money as directed. She protested that marrying a divorced man would have been too dreadful to contemplate. The disposition of the case is not clear." "It was not until 1894 that Mrs. Waldo, then living at the old Hotel Savoy, began to build an impressive limestone mansion, along with a smaller house on the inside lot," the article continued, adding that "In the French Renaissance style, it would have fit in just fine with those on Fifth. In any event, it had elegant company on Madison Avenue, which north of 59th attracted perhaps a dozen mansions. Consuelo Vanderbilt was living in one on the southwest corner of 72nd when she married the Duke of Marlborough in 1895. Kimball & Thompson received design credit in architectural periodicals, but a photograph of the mansion published at or near the end of construction included the notation that it was designed by Alexander Mackintosh, an obscure local practitioner. With delicate, lacy Loire Valley trim, it has so many windows, it looks as if somebody had taken a shotgun to it. There was said to be a top-floor ballroom and 2,000 electric lights, but only two bedrooms for servants. The New York Times opined that such a house would require a staff of at least a dozen. Mrs. Waldo's overwrought dwelling was completed by 1898. One directory lists her as residing there, but that is probably an error. All other period sources say she remained in her sister's much more modest row house across the street, and never moved in. At her death in 1914, The New York Sun described Mrs. Waldo as of forceful manner and some unusual views on art, dress and society, and said that she had vowed to leave the United States several times....Mrs. Waldo resigned from a club in indignation in 1909 when another member criticized her dress. And in 1912 The Sun reported that she was sued for illegally transferring assets to her sister to avoid payment of a debt. The outcome of most of these complaints is hazy. At the same time, Mrs. Waldo personally collected rents in her twin apartment buildings, the Kaiser and the Rhine, at Second Avenue and 89th Street; in 1904, when a fire broke out, she tried to get through police lines to rescue her tenants; no one was killed." "In 1909," the article continued, "The Times reported that her remarkable house, built and furnished at a cost of $1 million, was in foreclosure, its limestone badly discolored, its great glass dome cracked. By the 1920s the house was the headquarters of Olivotti & Company decorators, with apartments upstairs. Polo Ralph Lauren arrived in the late 1980s, and the building is still a Ralph Lauren store. The company has just treated it to an extensive exterior restoration, simultaneous with the completion of a second store across the street on the site of Consuelo Vanderbilt's mansion. For the new building, Weddle Gilmore Architects has produced an assured and demure neo-Classic design, French in character. At the time of proposal it was challenged by some preservationists as a fake, but as it stands, it is magnificent. The peculiar story of Mrs. Waldo is not unusual; New York has other private houses that for unexplained reasons were never occupied by their rich owners. But Mrs. Waldo's case is a particularly sorry one; although she had inherited millions, in 1915 The Times reported that she died in debt for $135,000." With the completion in October 2010 of the new four-story Ralph Lauren building across the avenue (see The City Review article), this fine "mansion" now has a more appropriate "setting" and the neighborhood and Madison Avenue are much better off.